One of the exciting things about adding a screen enclosure to your home is discovering all of the ways that you can make it uniquely yours, and tailor it to your lifestyle and needs. Not only does the flexible nature of the way they are manufactured allow for a huge variance in form, but even after it is constructed you will find no end to the many great accessories and additive features that can completely change the feel and function of each space. 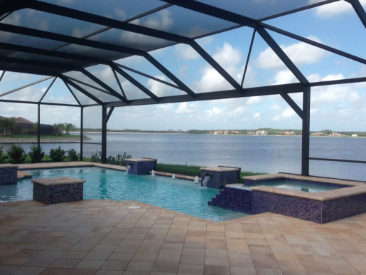 These can be pieces that are fastened to the structure, inlaid in the foundation, or even an option in the screen itself as with privacy screens for your pool cage, which can be a great way to close off your backyard area in a highly populated area and still allow for good breeze and light, these are typically installed using specialized materials from Glas-shield or Shade screen. Other options like this, that operate more as substructures, include horizontal sliding windows and visibility or picture windows. For these, large sections of the screen room are designed to be left open without the intrusion of beams or cables, and are typically requested by customers who live along side beachfronts, golf course, or lakes, allowing them to maintain their great view while still enjoying the benefits of an enclosure. These can be added to existing structures as well as of course designed in from the beginning of a project, and are always created in way that sacrifices no stability or safety in the form. 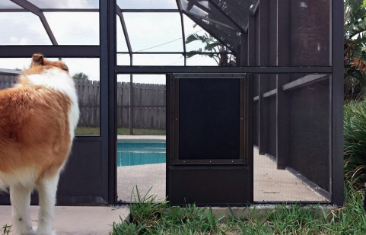 Another smaller add on is our dog and cat doors, a good solution to letting pets in and out without leaving your screened in area susceptible to the invasion of bugs or other pests. Not only will your pet appreciate the gesture, you'll be glad how much time you will save not spent on letting them in and out. 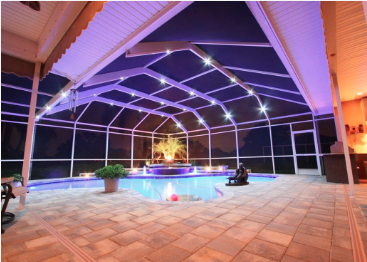 One of our most favorite and dramatic features to add to a screened in patio is lighting, there are so many styles to choose from and the impact on the feel of the space is remarkable. It can be a very cost effective way to bring your area to life, set a mood, or even as a safety measure for kids at night. Options include color, spread, modes, as well as dimming. These can be installed any way you see fit, but are most commonly mounted to the overhead aluminum beams and place in a discrete and clean fashion. Another great way to amp up your outdoor experience is through the addition of speakers and audio systems, these are great for parties or even just a relaxing patio dinner. Over the years we have also seen people become very creative with how they treat the landscaping within their enclosures, sometimes creating an incredible oasis getaway with exotic plants, imitation hot springs, and even waterfalls, we can certainly facilitate in making this happen for you if you wish! If you really want to take your outdoor entertainment and hosting to the net level, you can check out our previous work and capabilities in mounting exterior projector units and creating built in movie screens, next time your watching the football game you can also be relaxing in the pool or hot tub! These features just include a quick overview, and there is so much to be discovered when it comes to screen enclosure accessories, nothing is too complicated even if it requires wiring or even plumbing as with mounted pool showers, with our many years have service we have seen almost everything and have as well established a great network of suppliers and have developed partnerships that will get you anything you can dream up installed at great rates! Feel free to give us a call today to find out all of the possibilities or personalization.